Sunday gone was perhaps the first time in over two months that we had a decent spell of sunshine that lasted all day long. We just had to make the most of it. 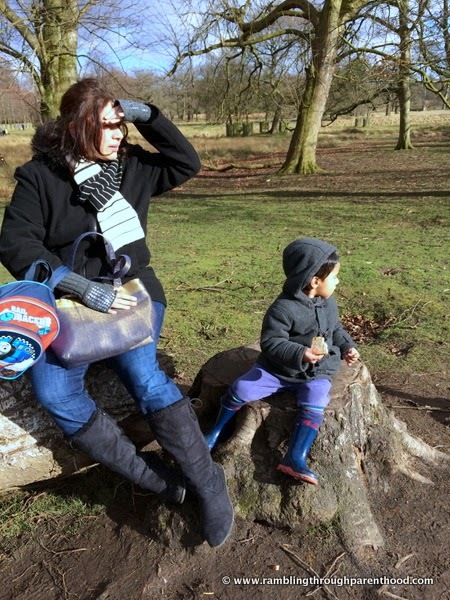 So we headed off to Dunham Massey, a National Trust Site in North Cheshire, to bask in the glory of the winter sun. 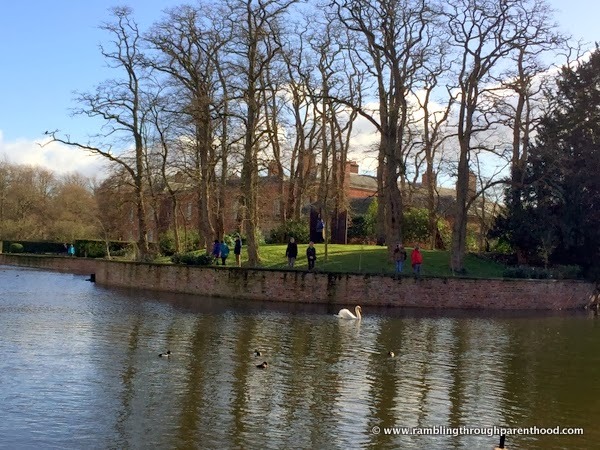 The estate at Dunham Massey has an old Edwardian House and gardens set as a backdrop to a huge deer park. 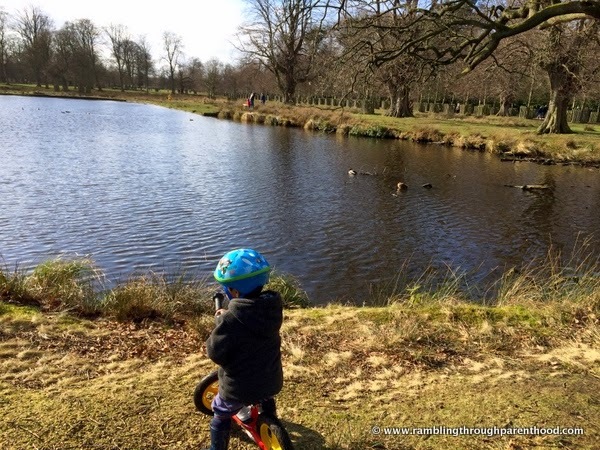 The idea was to let J loose in the deer park on his balance bike. It all started well enough, with J cautiously riding his bicycle to the edge of the lake to watch all the aquatic birds feed on pieces of bread. And then it went a bit awry. He wanted to throw chunks of bread at the assorted collection of swans, ducks and geese. Unfortunately, I was ill-equipped to meet this demand. I had not carried any bread as it is not supposed to be good for the digestive systems of these birds. It is said to cause bloating and stops them eating their natural food like insects. Try telling that to a toddler who has taken it in his little head that he needs to feed these poor hungry birds. I had to improvise. Think out of the box. Forage for bread droppings along the edge of the lake. Salvage tidbits dropped by other enthusiastic bird-feeders, and like a mother bird, carry these back to my squawking child. Not for him to feed on, but so that he could feed the birds. The only way I could pry him away from that lake was to create a diversion. Lady Luck was shining down upon us along with the rays of the winter sun. 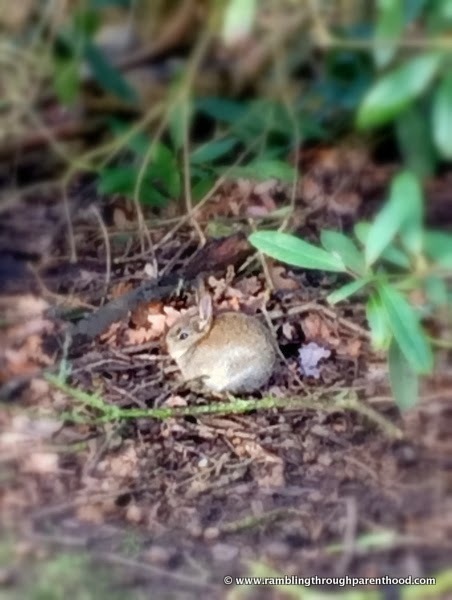 I spotted a little baby rabbit a bit further along from the lake. J went hopping along in glee. Much to the horror of the poor little petrified rabbit, who just sat there as if stunned. So J stood and stared at the bunny, while all the time, the poor bunny sat there in mortal fear of its life. After a few minutes of this, I just had to move J along for fear the rabbit might go into a state of permanent shock. It was now approaching lunch time, as it usually does at about this time. And we had hardly made any progress into the deer park at all. The last thing to do now would be to sit down for lunch. That would just signal the end of any and all planned activity. So we tried to coax a very reluctant J along, pointing to this, that and the other. Hoping the site of a few deer might spur him on. There were none! There was nothing on earth that would make my hungry child cycle along in a deer park that had no deer. So the decision was made to feed him. Which was when I realised I had forgotten to pack his sandwich. A classic parenting fail. But his trusty backpack always has a stash of food rations for precisely such a moment. Crackers, dried fruit and rice cakes to the rescue! Calamity averted. J perched on a short stump of a tree trunk and was happy to polish off what can only be described as snacks. I plopped down next to him on the short stumpy tree trunk, while M captured a meerkat moment - J and I looking over at something, staring in generally the same direction. By now, J had his energy stores bountifully replenished. He was ready for the great outdoors. He started by climbing on the short stumpy tree trunk on which he was sat quietly not a moment ago. 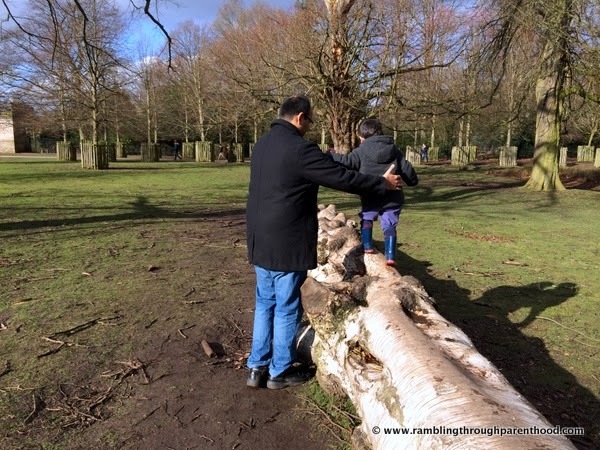 Then with a little help from M, he walked back and forth along the fallen tree trunk. A good few times, growing in confidence with every step. 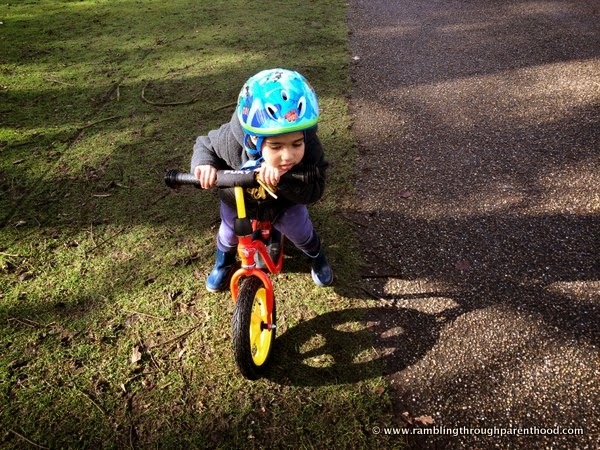 Soon he was back on his balance bike and zipping along like a little BMX biker. He was so full of beans, that we went along a long circuitous route all along the edge of the deer park. Stopping only at another lake to gawk at a few more of the aquatic creatures. J was in his element on his bike. Muddy patches, puddles, soggy grass, broken tree trunks, carpets of fallen seed, he took it all in is stride. Quite literally, as he was on a balance bike. And then he was hungry again. And tired. So we headed off to the newly opened visitor centre that houses a cafe and stuffed ourselves with cake and gingerbread men. What a lovely place to visit and I love your photo's. Especially the bunny! Well done for averting a massive toddler tantrum! it's so hard to reason with them isn't it! Aww, what a lovely day out! I love the bunny pic - so cute! Well done on averting tantrums along the way as well! I think when you are mum to a tot, you just start improvising and thinking out of the box! It was the least I could do to stop him throwing pebbles into the water! I do hope your little girl has as much fun on her bike as J does on his. Has she got a balance bike too? Dunham Massey is rather beautiful. i have always enjoyed a little walk there when the sun comes shining out. Looks and sounds such a great day out. I love balance bikes, wish they'd been about when my oldest was younger. always nice when there's a couple days sun! that bunny is adorable. Oh my gosh this rabbit it tiny... what a great shot! Looks lovely, i've not been to any NT places in this area so am off to check out their website for a few more to add to the list! Looks like a fantastic place for a family walk and there really is no talking a toddler round is there! That looks like a great place to visit and it sounds like you had a lot of fun. It's great to have some sunshine to enjoy isn't it! Hooray for sunshine and beautiful NT properties to explore and get some much needed fresh air and exercise. It looks like you all had a great time and J enjoyed the adventure on his balance bike. Thanks for linking up and sharing your family fun with Country Kids. great post, love the bunny! That looks like a really special adventure :) that baby bunny is so cute! I was lucky they worked this time! Not always the case, though. Phew - glad you had that trusty backpack! Sounds like a great day out and sunshine too!